2 time gold medalist – Paralympics in Sydney 2000 and Athens 2004. In 2004 he retired his basketball wheels, but that competitive spirit remains. Travis has turned to a hand bike to not only stay in shape, but also to continue pushing himself as an athlete for the rest of his life. He rides a Top End Rx and hand bikes in local races in the Puget Sound area. He recently competed in the 75-mile Flying Wheels ride alongside able-body cyclists and a fellow hand cyclist, which he finished in 5 hours. Travis on His Hand Bike During the Flying Wheels Race Where Hand Cranked 75 Miles in 5 Hours. A father of three who travels frequently for work, Travis is like any other hard working dad who has to find ways to fit training into a busy schedule. When he’s home, he wakes up at 5:00 a.m. four days a week to squeeze in training on his SciFit Upper Body Ergometer before his wife and kids wake up. These aren’t your ordinary workouts. Travis straps himself into the SciFit and hand cycles hard for 60 minutes with a typical average heart rate between 150 – 160 bpm. His resistance levels are typically between 150-170 watts depending on the scheduled workout. His SciFit workout of choice is the either constant work intervals at a percentage of his Function Power Threshold or Power Fit Training In his home gym, he also has free-weight dumbbells and a weight lifting bench. But Travis really wants to be outside. Two days a week, he jumps on his Top End Rx hand bike and cranks out an average of 35 miles throughout his neighborhood which is full of hills to climb. He uses Strava to map his rides and recently hit a personal best on a 3-hour 48.1-mile ride with an average heart rate of 130 (max BPM of 168). This take serious commitment and dedication. One day, Travis was hand cycling and a driver came up behind him and didn’t see him despite his cautionary flags. She ran him over and dragged Travis and his hand bike ~75+ feet before she heard him yelling to stop. For some, that might make them reconsider their love of a hand bike, but not Travis, who turned around and bought another hand cycle. When Travis travels for work, it has been a struggle to find the perfect alternative to his SciFit Upper Body Ergometer. 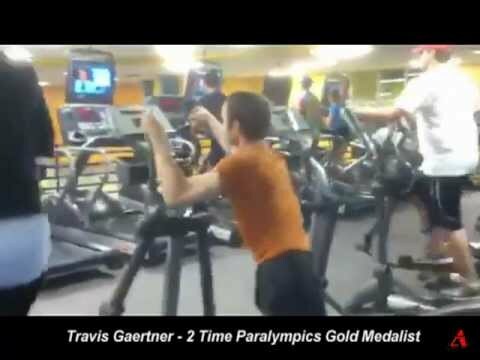 He first trained himself to use an elliptical machine while traveling, but that led to a back injury with material compression to multiple vertebrae that put him in physical therapy for 12 months.Travis then turned to using the hotel gym stationary exercise bike as a hand bike. Imagine the commitment to go to a hotel gym at 5:00 a.m., sit on the dirty gym floor to reach for the exercise bike foot pedals to pedal your hands. 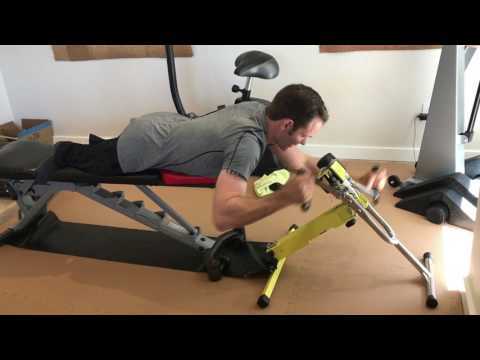 Tired of being on the gym floor armed with antibacterial wipes to clean the hotel exercise bike, Travis discovered Excy as a lightweight, portable gym quality full body pedal exerciser that he can use as an upper body ergometer anywhere. Travis recently went on a family vacation and took Excy with him. He kept his routine of hand pedaling daily, combining 60+ minutes of constant work with high impact interval training. Excy offers 2-70 pounds of resistance, so Travis can get a quality hand bike workout whenever and wherever he wants while traveling. He even found himself hand cranking Excy in the hotel parking lot one day to get some fresh air and not wake up the family and cranked out an hour hand cycle cardio and strength training workout with an average heart rate of 129. In addition to hand cranking Excy at high resistance and a fast tempo, Travis is also using Excy to work other muscle groups not offered by his SciFit, including different workout positions that allow him to focus on cross training and strengthening his core and back. In addition to using Excy while traveling, Travis is now exploring all the different ways to incorporate Excy for adaptive training in his home gym for weight and cardio training alongside his SciFit routines as he prepares for the Portland marathon in October. We will be onsite to cheer him on! Today, thousands of people, able-bodied and those with disabilities, are turning to a hand bike as a means to improve their cardiovascular health, increase upper-body strength, compete, and ride with friends and family. Few people recognize that you can burn more calories hand cycling than in spin class, so it’s an amazing alternative to mix up an exercise routine. There are very few people who can keep up with Travis’ levels of endurance with upper body conditioning, but it’s worth exploring and trying some of his Excy moves for your own conditioning regimen. See more live training and how to use Excy as a recumbent exercise bike, upper body ergometer, and full body resistance trainer at www.excy.live.